The brick ovens of Italy are renowned for legendary artisan pizzas, with perfectly crisp crust and toppings melded together. Now enjoy true artisan style pizza on your own patio with the portable Italia Artisan Pizza Oven. Specially designed features replicate the performance of a woodfired brick oven from its double walled construction and specially designed burners to its ventilation and cordierite ceramic pizza stone. Microadjust valves give you heat control and responsiveness to cook perfect artisan pizza every time. This GE 1.6 Cu.Ft. Over-The-Range Microwave Oven fits in the space of your range hood. It is equipped with a ventilation system and lighting system for the range below. It features Electronic Touch Controls with 10 Power Levels which offers the flexibility to accurately cook any meal, from frozen entrees to refrigerated casserole dishes. It also features Child Lock Out which allows you to lock the control panel to prevent the microwave from being accidently started or used by children. Italia Artisan Pizza Oven The brick ovens of Italy are renowned for legendary artisan pizzas, with perfectly crisp crust and toppings melded together. Now enjoy true artisan style pizza on your own patio with the portable Italia Artisan Pizza Oven. Specially designed features replicate the performance of a woodfired brick oven from its double walled construction and specially designed burners to its ventilation and cordierite ceramic pizza stone. Microadjust valves give you heat control and responsiveness to cook perfect artisan pizza every time. 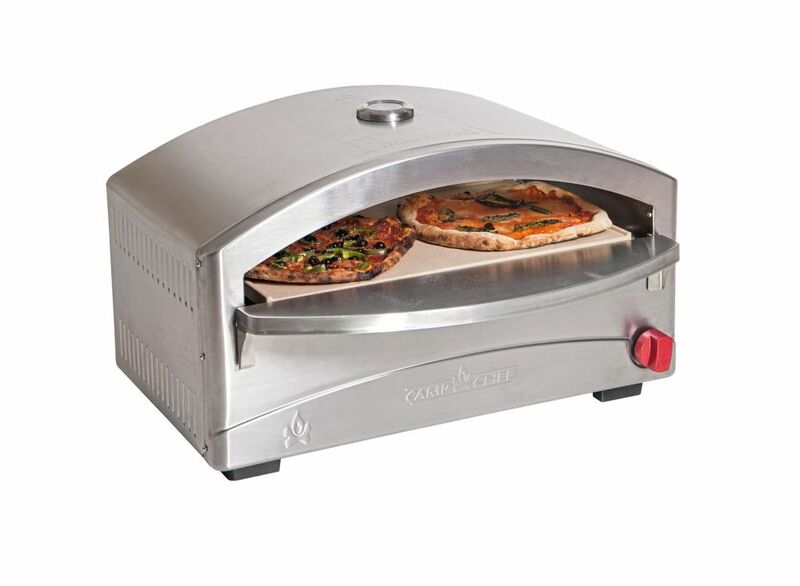 Italia Artisan Pizza Oven is rated 4.5 out of 5 by 40. Rated 5 out of 5 by PizzaTheHut from Not sure why the previous review couldn't get the temp up. I reached close to 700F. The assembly ... Not sure why the previous review couldn't get the temp up. I reached close to 700F. The assembly was easy. You just need a Phillips screwdriver. So I just tried this oven with a store-bought, uncooked pizza because I just wanted to test the oven, and not be distracted by making pizza from scratch. The result was a pretty good pizza (it wasn't the best but that was due to the store-bought pizza, not the oven). And it was fast! The crust was nice and crunchy, just the way I like it. I'll be making lots of pizzas from scratch this Summer--can't wait! Rated 2 out of 5 by jpkinco from Look for a better oven. This one does not get over 300 degrees. Kitchen oven is a better choice ... Look for a better oven. This one does not get over 300 degrees. Kitchen oven is a better choice then this one. Does not even come close to description. Rated 5 out of 5 by jjay from So Convenient! Love that this is small and convenient and still makes amazing pizzas!! Rated 5 out of 5 by HR from Works great! No complaints at all.... Works great! No complaints at all. Rated 1 out of 5 by PizzaChef from Only worked twice. Does not consistently lite. Appeared... Only worked twice. Does not consistently lite. Appeared to be a little damaged when I received it, and maybe that had something to do with it? Camp Chef support is responding with some pdfs, but everything I tried they recommended had no impact. I'm ready to return it. I think I got a lemon.